Leadhills Silver Band is delighted to share Alan Fernie’s “Music for Distant Hills” with the rest of the banding world. Bands can now request access to the download of the sheet music by emailing leadhillssilverband@hotmail.com. 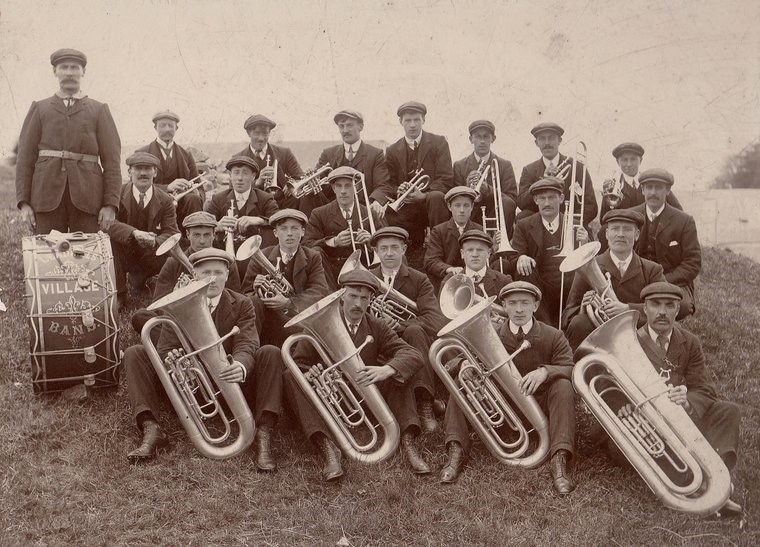 The project had its origins in an old sepia photograph of Leadhills Village Band taken in the early years of 1900. It captures the members of the lead mining band proudly grasping their beautifully engraved instruments dated 1907 (some of which are still in use today). Seen in light of the outbreak of war that shortly followed, the photograph took on a poignant role as the current members of the band wondered how the war had affected and altered these individuals’ lives and the life of the two villages. Music was obviously of great importance and a very much celebrated part of village life. The band wanted to acknowledge that, and commissioned the new piece of music, specifically tailored for community and youth bands, to mark the WW1 centenary. Alan Fernie was asked to compose a special piece of music that was first performed in Leadhills Village Hall on 10th and 11th November 2018, to mark the centenary of the end of the First World War. Now that the band has completed their performance in Perth in March, the piece has been published and copies are offered to youth bands throughout Scotland.